ALEXANDRIA — The injured American bald eagle rescued the backyard of an Alexandria Township home on Thursday was shot and suffered a broken leg from a pellet still lodged in the bird. The injury is recent, he said. Medical staff with The Raptor Trust worry that the eagle suffered more than just the broken leg. “It also has a little bit of blood in its mouth, so it may have been peppered with pellets,” Soucy said. They won’t know the full extent of the bird’s injuries until they can do full-body X-rays, and since they have to be done under anesthesia, those will have to wait a few days. “Now we’re giving the bird some fluids — it must have gotten very dehydrated in that tree for four days — and some nutrients,” Soucy said. The bird is being kept quiet, in a darkened area, so it can stabilize and be in better shape for the surgery, tentatively set for Sunday. Residents in Alexandria first saw the bald eagle on Monday and alerted homeowner Courtney Heath to the bird stationed in her backyard tree, Heath told CBS3 in Philadelphia. The residents soon realized the bird had an injured leg and had not moved from the backyard. 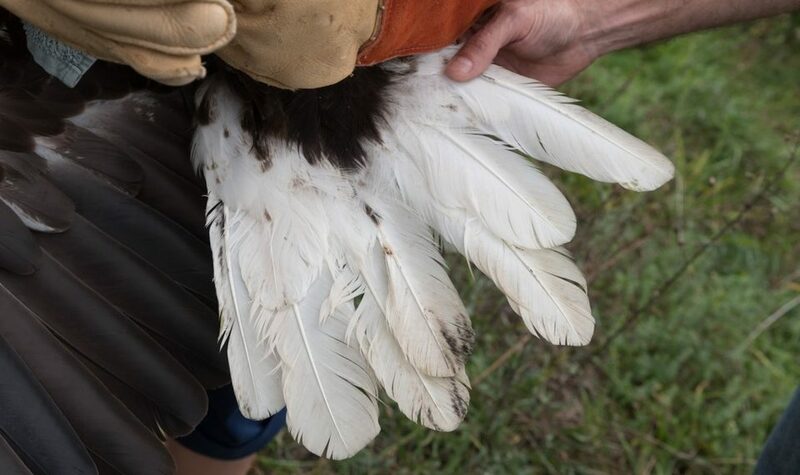 They alerted the state Department of Environmental Protection’s Division of Fish and Wildlife, which also brought The Raptor Trust and Avian Wildlife Center to assist in the capture effort. “I was out there in Pittstown for three days trying to catch the bird,” Soucy said. Giselle Smisko, director of the Avian Wildlife Center in Wantage, and volunteer Katie Besbris were finally able to cover the eagle with blankets after crows had dive-bombed it, forcing it closer to the ground. The eagle is a sub-adult between 3 and 4 years old, Soucy said. The leg X-ray taken at The Raptor Trust is being sent to Kathy Clark, head of Division of Fish and Wildlife’s Endangered and Non-Game Species Program, so team members can determine the type of pellet that injured the eagle. Soucy said one bit of good news for the eagle is that the fractured leg bone broke in the middle of the shaft. “A mid-shaft break is generally easier to repair,” he said, and offers a better opportunity for recovery. That blood in the mouth is worrisome, though. For now, allowing the bird to rest and recuperate is paramount. “We’ve got the bird here, and we’re doing our best to treat it,” Soucy said.